Cooking since the age of fourteen, Chef Michael Midgley brought his culinary talents to Lincoln Center after opening Midgley’s Public House in November of 2014. And it won’t be subtle if we take into consideration his nationally recognized awards. Midgley’s Public House is an exciting, culinary experience serving American-fusion, paired with spirits and fine wine. 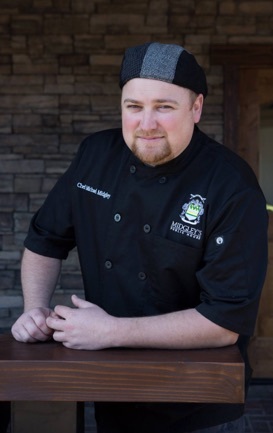 Chef Midgley has been named a brand ambassador for the Certified Angus Beef brand. Chef Midgley has made a name for himself in the culinary world. He attended California Culinary Academy in San Francisco and was most recently the Executive Chef at Ernie’s Food and Spirits in Manteca. His big and vivacious personality expands way beyond San Joaquin County. He has appeared as a contestant on Bravo television’s “Top Chef” and was the top winner of Food Network’s “Cut Throat Kitchen”. As he reached ‘celebrity chef’ status, he has appeared as a judge on Esquire network’s “Knife Fight” and Bravo’s “Top Chef Masters, as well as appearing on CNBC’s Restaurant Start up with his wife, Laci. Now his celebrity chef status is taking a back burner to his passion of operating his own restaurant – and his passion to serve great food! Involved in every detail of the design of the restaurant to the savory selections on the menu, the opening of Midgley’s Public House is not only a dream, it is now a reality. Chef Midgley and his wife Laci reside in Stockton with their three children.